You might be thinking that there’s a pretty major problem with the title of this post, but nope! The 3 moms I’m thinking of were (probably) the some of the greatest Bible moms. We’re talking serious #momgoals here, but these mamas have no words written about them in the scriptures. We don’t know their names or much about their circumstances. a good tree does not bear bad fruit, nor does a bad tree bear good fruit. For every tree is known by its own fruit. -Luke 43-44a. 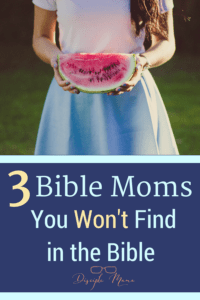 These Bible moms produced the kind of fruit that they could be really proud of, and I think discipleship parents can learn a lot from them, even today. I don’t know the daughter’s name, but she’s definitely a hero. She was kidnapped from her home in Israel by Syrians, and served in the household of Syria’s army commander. But, when he was stricken with leprosy, she came to the rescue, telling him where he could find healing. That’s loving your enemy, if anything ever was. And, what’s more, this powerful man listens to her. He hops in his chariot, and goes off to find the man she recommended. To me, this is a powerful testament to the way she must have conducted herself. Her captor felt she was trustworthy and reliable enough to go out on a limb on her word. This girl was faithful and kind, even to her enemy. Just think about this girl’s mama for a second! She must have really taught her daughter to be a true disciple of God, even when separated from her family and other believers. Find the whole story in 2 Kings 5. Again, an unnamed child is our hero. This one is hungry. He’s been listening to Jesus speak all day (presumably without his parents around). But, when he finds out that Jesus is looking for food to feed to the crowd, he offers up his little lunch. I don’t know about you, but I was excited when my son offered me a cucumber stick from his plate this afternoon. I find it difficult to imagine a scenario in which he’d willingly forego his entire lunch, not knowing when he’ll get his next meal. But, it seems that the Lad in this story (found in John 6) was faithful and generous. His mom had probably put in plenty of time helping him push aside his selfishness until it had become a habit for him. Last, but not least, we have a character who starts as a child and remains heroic throughout his adult life. He starts out by declining fancy food and asking his captors for healthy cuisine, instead (Daniel 1). That, in itself, is a parenting victory for Daniel’s mom. He goes on to even bigger and better things, including remaining brave and faithful to God as he’s literally thrown to the lions (Daniel 6). Daniel, at least in the beginning of his story, has the benefit of friends who are also making godly choices. Daniel’s mom gets my respect for teaching him to honor his body, surrounding him with positive peer influences, and giving him the foundation for his lifelong dependence on prayer. Focus on discipleship from day 1: we don’t know how long we h ave to deeply instill spiritual values in our kids. We can (and should) teach our kids to love their neighbors and their enemies. Teaching our kids to be unselfish is not an exercise in futility. We should not underestimate the importance of teaching our children the principals of health. Parents should carefully consider the influences surrounding their kids, right from the beginning. Prayer is key to discipleship parenting. We need to teach it, model it, and experience it personally in order to be successful Christian moms. Sadly, two of these Bible moms never knew for sure how their careful parenting had influenced their children. I imagine that each of them spent long hours in prayer for their kids for the rest of their lives. These ladies didn’t get much recognition for their labors of love (that’s just how momming usually goes, right?). But when I see them in Heaven I’m going to be sure to thank them for the positive influences that their parenting had on me and my kids. Want to keep reading? Check out this post on teaching by example! If you’d like to receive posts like this directly to your inbox, sign up for the Disciple Mama newsletter here! Let God Lead-Who's the Pilot, Anyway? Thank you, Felissa! We can all use all the help we can get! Thank so much for this encouraging post. We often don’t think about the unseen parts in the lives of those mentioned in Scripture. 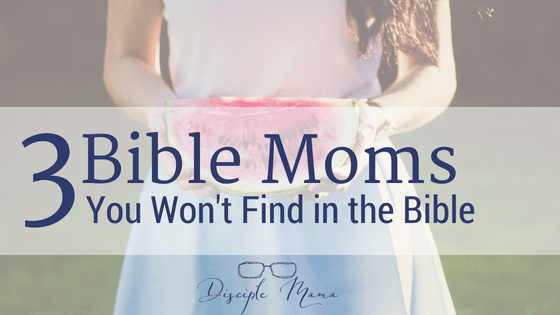 This was very thought provoking and now I want to find even more unseen Bible moms! Thank you, Jacquelyn! There are so many great unknown women who were almost in the Bible, right?! It is wonderful reading such a blog – to read how you have seen a deeper story and a deeper truth in words and verses I have freely skipped over for years. Hmmm – not to self read deeper – read slower. Thank you so much for your kind words, Bob! I’m so glad that you enjoyed this post. Being a mother has really opened my eyes to a lot that I never paid much attention to in the Bible before. Thanks for visiting the blog again today! Yes! We can teach and train our children —it’s not easy, the rewards are not immediate (much of the time), but the fruit it grows and instills in our children can have a tremendous impact, much like the two examples you gave. Thank you for sharing truth! It sure can be hard to patiently pray and teach our kids when the fruits of our labor are not immediately evident, but it’s comforting to know that it is possible to pass on these important lessons even if we don’t see the results right away. Thank you so much for visiting my blog today, Lisa! Come back again soon! I had somewhat of a really messed up and traumatic childhood. I didn’t have much in the way of good parenting, but my grandma showed me a lesson on generosity when I was just a kid. She had her own brokenness and was not the nicest person, but she took the time to one time teach me about generosity making me choose between a Ken doll and or buying groceries for a poor street kid without legs that we had met. It stuck with me and to this day I give her credit for teaching me how to be generous (and why). As I read your post, I thought about that. Things like generosity, loving your neighbor, are things that we CAN teach our children–we just need to be intentional about it. I’m sorry to hear that your childhood was so difficult, Luisa. I am glad, though, that you’ve learned a lot from it and have made decisions to be intentional about being a good parent, yourself. Thanks for sharing about the lesson in generosity that your grandma taught you. Setting an example by actually doing (and involving our kids in the actions) rather than just telling is so important if we want the lessons to stick in their minds. Thanks for stopping by the blog today, and for sharing. This is a wonderful devotional! I love how you took these 3 kids and pulled out such practical advise! What an encouragement to us all! Being a mom is more than feeding, clothing and diapering. We have the wonderful opportunity of molding our children and grandchildren(s) lives for good. What a shame that many in our culture don’t have a clue or take the opportunity God has given them to use for good in helping their children be all that they can be. Thank you for this great reminder! Hi Tricia, I’m so glad you enjoyed this little devotional. I just hope that I am taking advantage of the time I have with my kids, because the truth is that we never know when those opportunities will disappear. Thank you for visiting my blog! Come back anytime! My favourite here was what you said about Daniel’s mom. You are right; she must have taught him some valuable lessons in life. I just hope that I can teach my kids half as well as Daniel’s mom must have done! Thanks for visiting my blog again, Edna!